At Grove Park, we see our growing Junior squash section as vital to the development of our club. Our main squash coaching sessions with England Squash Qualified Coaches, run throughout the year on Saturday afternoons from 1pm . All you need to get started are loose fitting clothing and a pair of clean trainers (preferably with non-marking soles). Parents are welcome to watch or help (just bring your trainers). Rackets are available to borrow. To help chart the progress of all the players we have just launched a junior ladder. The year is rounded off with the annual club junior closed tournament. With lots of trophies and t-shirts for all. This is a fun event to end the year. This 2017 tournament took place on Saturday 16th December. See how they got on. matches start in October and are played once a month on Sunday mornings. 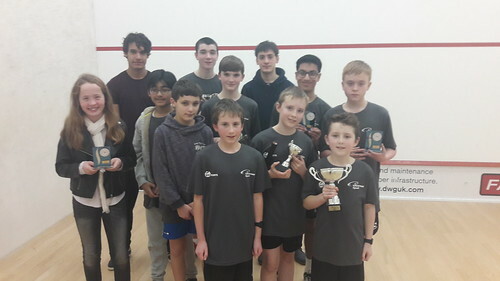 The Grove Park Potential Squash Academy is an invite only squash academy for juniors at Grove Park who have demonstrated enthusiasm for squash, a willingness to improve and good behaviour at squash sessions. There is an emphasis on learning and improvement during all sessions. The sessions are weekly thoughout the year on Wednesday evenings - 5.45pm - 7pm. Click for more details or to register online. Squash camps are organised all year round during school holidays. Information on squash camps will be made available once dates are set. If a full years worth of lessons are purchased for £60 (or £50 if you pay before September 1st) the child will receive the benefits of Junior (U19) Membership so they can play at times other than the organised lessons. These benefits are also free for U16 children/grandchildren of existing members (just email names and d.o.b. to Derek or I). The light meter costs £4 for 40 minutes for two members to play or £1 for 20 minutes on Monday Clubnight. Junior squash members can play any time when playing another adult member. Juniors playing other juniors must (for safety reasons) be accompanied by an adult. Junior members can enjoy benefits of a full membership (play in the internal leagues, book courts and be available for the senior teams). Manchester Rugby Club Mini and Junior Sections. Mini Squash sessions were added so children from as young as five can join the fun. Mini Squash is an exciting game that encourages children aged 5 to 11 to get on court and have fun. Using specialised equipment designed to help children learn the basic skills as well as develop coordination and balance, Mini Squash provides the ideal introduction to squash.